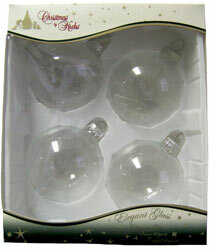 These clear glass ornaments come in a set of four, 3.5 inch diameter ball that have a silver decorative cap with a silver hanger loop. They come in a window gift box that can be used from year to year for storage. Great for any craft project, bible school, Scout projects, teacher gifts, Sunday school classes and weddings. Try filling them with potpourri or very narrow strips of iridescent or colored ribbon for a special decorator touch. You can even use them as a centerpiece by putting them in a beautiful bowl with colored ribbon, bows or other Christmas ornaments.